Access to Monitoring and Measuring Devices and Instruments is provided through the Main Menu Icon Bar. The Monitoring and Measurement Device Table provides extensive support for device inventory and calibration and maintenance journal. A.Device Name is a user-defined text field. The Device Id Number field is a unique Id assigned by QMSCAPA. B.The Copy to Excel button executes a process to copy the browse table for Monitoring and Measuring Devices to Excel. Microsoft Excel must be active on your Windows computer or in a Windows Server with a Remote Desktop. C.The View (all) MMD Log button displays the table of all Monitoring and Measuring Device Journal entries for Calibrations and Maintenance. The Calibrations and Maintenance Log may be copied out to Excel. 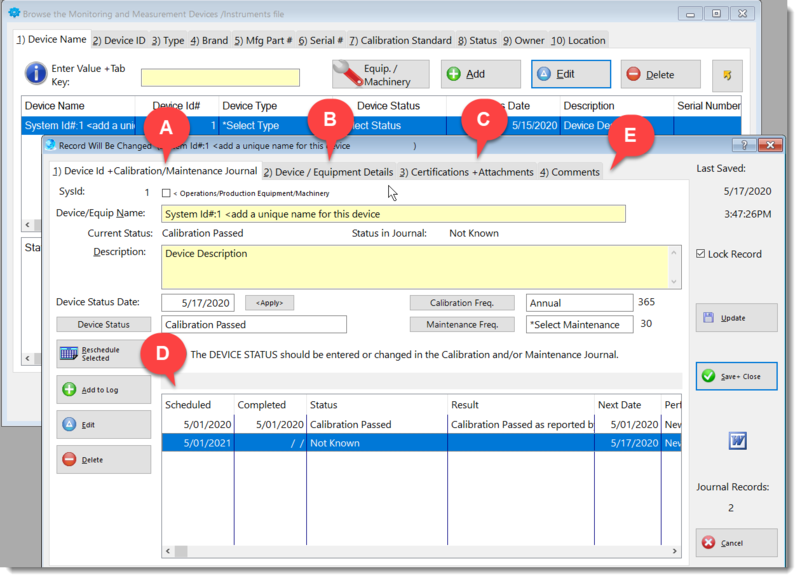 D.The View (1) MMD Log button displays the table of Monitoring and Measuring Device Journal entries for Calibrations and Maintenance of a single device. 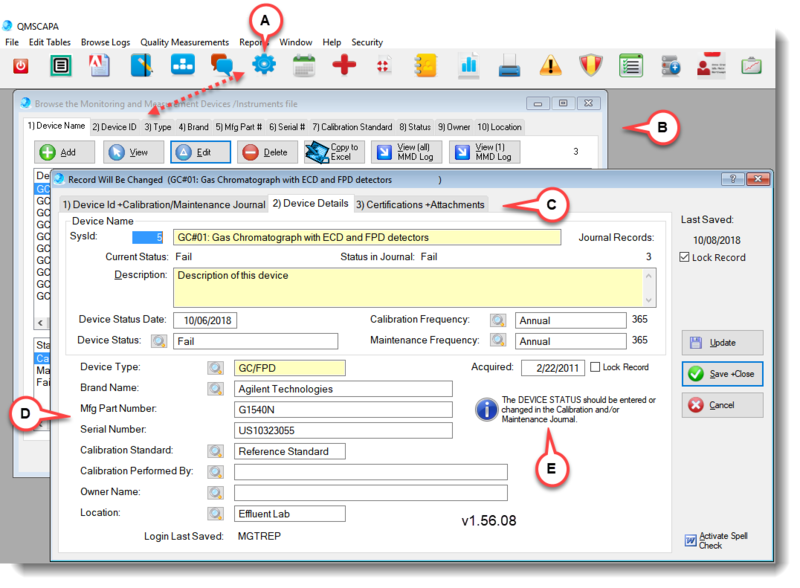 E.The Monitoring and Measuring Device Journal entries for Calibrations and Maintenance of a single device (highlighted device record). F.The Print Report buttons provide direct access to Monitoring and Measuring Device Reports. 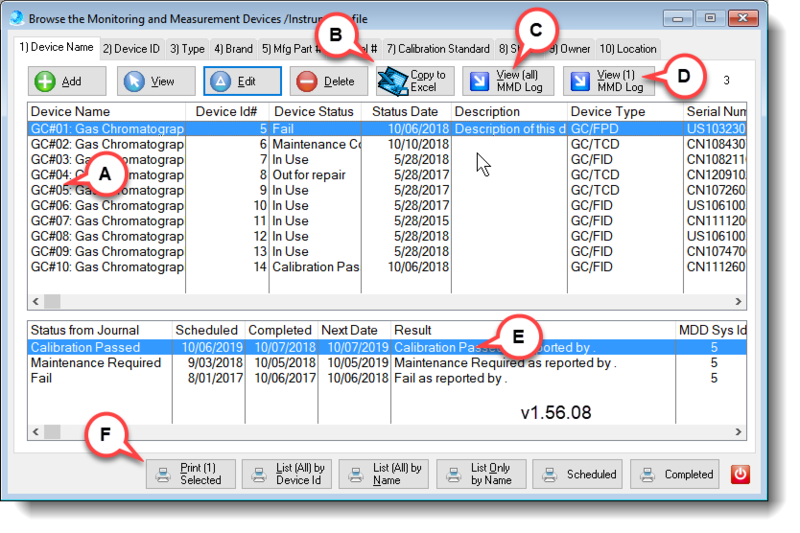 A.Monitoring and Measuring Device Table may accessed from Gear Icon (Cog Icon). B.Monitoring and Measuring Device details on Tab 2) of the Monitoring and Measurement Device Form. 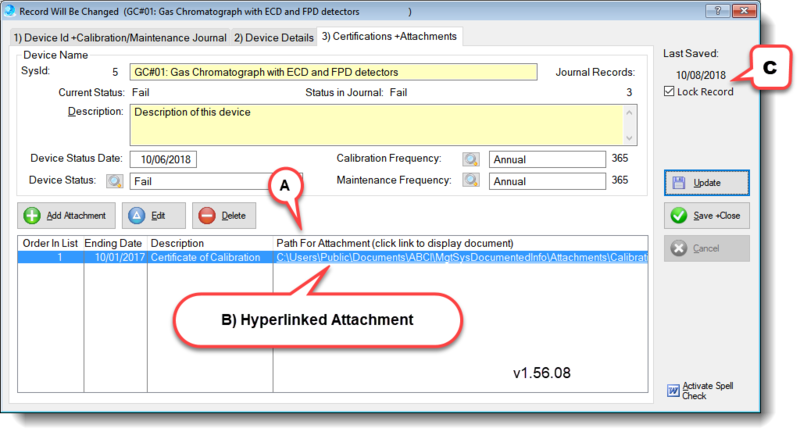 C.Attachments for Monitoring and Measuring Device Certifications. A.The Path for Attachments may stored and hyper-linked to an electronic file. B.Click on the underlined text to open the attachment. The application for the attachment must be installed and active on the Computer/Server in use.